vibrant Indian gastronomy. The restaurant is popular and has been one of the fine dining options when it comes to serving excellent vegetarian food in Raipur. It offers a stunning ambience where people can revive and enjoy the delicious cuisine. In addition, the versatile space makes it an excellent option for all types of dinning occasions whether for breakfast, lunch or dinner. Every dish prepared at the restaurant is an amalgamation of modernity, while at the same time retaining authenticity of the Indian cuisine served at restaurant. Our aim is to serve the best quality of food to our customers. We have our laid standards while cooking the food and always use the best and superior quality of ingredients in the dishes. To achieve this, we acquired a team of highly experienced chefs. The restaurant serves some of the mouthwatering delicacies. The most popular among them are the different kinds of Indian Platter (Thalis); especially Rajasthani and Guajarati food Thali bring uniqueness to our menu. The vegetarian Cuisines served by the restaurant are well planned and is a healthy way to meet all the nutritional requirements of the customers dining there. 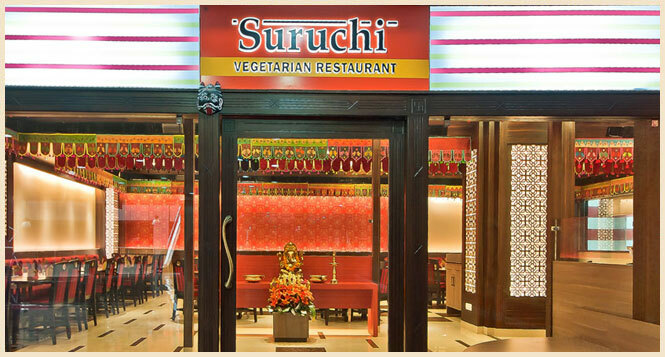 That is why Suruchi is best preferred place for kids dinning when it comes to healthy vegetarian food for kids. Apart from it, the restaurant also deals in serving the food through their home delivery service across locations in Raipur. The restaurant through its impeccable service, healthy and excellent food quality has become one of the finest places to eat in Raipur. People can go with their family and friends to enjoy some of the exquisite and delicious vegetarian dishes prepared by finest chefs.